Yahoo! Messenger 9, which currently in beta stage, has been updated to version 9.0.0.922 since last December. As usual, users who download the Yahoo! Messenger 9.0 Beta setup file from the beta page (no longer available) will get Yahoo! Suite installer instead, which has many other functions such as entice users to also install Yahoo! Toolbar, set Yahoo! as homepage and etc. For users who want the standalone setup installer for Yahoo! Messenger 9.0.0.922, just download the full version setup installation file, which can be used for offline installation or distribution on CD, using the links below. For users on Windows Vista, there is also Yahoo! Messenger for Windows Vista available, which also in beta phase. The latest version is 2008.01.11.428. For those who feel version 9 beta is not stable, use Yahoo! 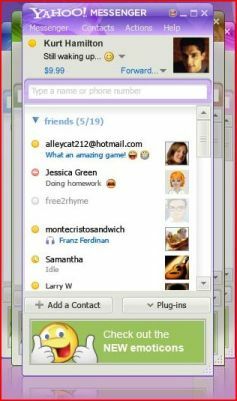 Messenger 8.1 final (latest version 8.1.0.421).